Samkhya is one of the oldest, if not the oldest, system of classical Indian philosophy. This book traces its history from the third or fourth century B. C. up through the twentieth century. The Encyclopedia as a whole will present the substance of the various Indian systems of thought to philosophers unable to read the Sanskrit and having difficulty in finding their way about in the translations (where such exist). 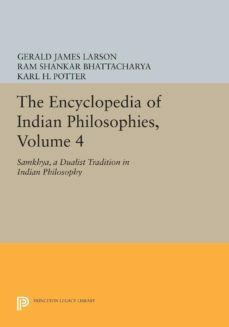 This volume includes a lengthy introduction by Gerald James Larson, which discusses the history of Samkhya and its philosophical contours overall. The remainder of the book includes summaries in English of all extant Sanskrit texts of the system.Originally published in 1987.The Princeton Legacy Library uses the latest print-on-demand technology to again make available previously out-of-print books from the distinguished backlist of Princeton University Press. These paperback editions preserve the original texts of these important books while presenting them in durable paperback editions. The goal of the Princeton Legacy Library is to vastly increase access to the rich scholarly heritage found in the thousands of books published by Princeton University Press since its founding in 1905.